SANTIAGO, Feb 24 2014 (IPS) - The idea sounds like harebrained science-fiction, but the accelerated retreat of glaciers due to global warming and the effects of mining is leading scientists to seek to restore or recreate these valuable reservoirs of fresh water. “There are a number of technologies for saving and creating new glaciers,” Chilean glaciologist Cedomir Marangunic told Tierramérica. This sounds like a sweet promise for Chile, a mining country with at least 3,100 glaciers, most of which are clearly retreating, according to official data. Glaciers, huge masses of ice and recrystallised snow, store 69 percent of the planet’s fresh water. They form when annual snowfall exceeds the amount of snow melted in summer, and accumulate enormous amounts of material over geologically short time frames. But when it comes to the work of human hands, the time needed to create a glacier depends on the money invested, Marangunic said. The minimum time for a sufficient mass of snow to turn completely to ice is three years, he said. “The natural process must be simulated, that is, winter snow accumulation must be greater than the summer melting. And that is not difficult to achieve; the main thing is to do it at minimum cost and in an environmentally sustainable way,” said Marangunic, a geologist at the University of Chile who holds a doctorate in glaciology from Ohio State University in the United States. The techniques he has tested “aim at reducing melting on the ice surface, or at increasing snow accumulation,” he said. 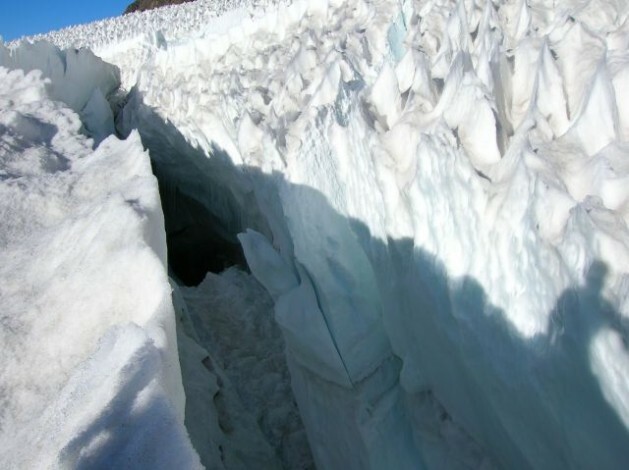 In experiments in Chile, an artificial deposit of ice was covered with rocky detritus, which reduced ablation (the loss of ice mass) to one-quarter or one-fifth of normal, the expert told Tierramérica. Marangunic heads a company that carries out research projects on glaciers, snow and avalanches. In 2007 he did an experiment transporting a mass of ice from one place to another. Using mining trucks, 30,000 tonnes of ice were taken in one day to a pre-prepared site. In its original location, the ice was retreating 15 cm per year, while in the new site it retreated 30 cm the first year, but then less and less, as expected. In 2012, the ice retreated only three centimetres. The expert tried transforming an ice field into a small glacier, by putting up barriers like those used for avalanche protection or on ski pistes, and modifying them to change wind direction during storms. This had the effect of doubling snow accumulation. Among the most frequently used techniques is “covering part of the glacier surface with geotextile sheets, which reduces surface ablation,” the glaciologist said. In a dry winter, for instance, there would not be enough snow for the accumulation a new glacier needs. And, because of climate change, it is expected that there will be increasingly more dry winters, Asun said. “I don’t doubt the good intentions of those who are trying to develop strategies to protect glaciers, because it is a fact that many of the risks could be minimised,” Asun told Tierramérica. “The key thing is to protect existing glaciers effectively. The glaciers are there, and they should stay there,” he said. In Latin America, 82 percent of the reserves of fresh water in glaciers are in Chile, according to Greenpeace. But a large proportion of Chilean glaciers are, or will be, threatened by climate change and the actions of the mining industry. “They are a strategic water reserve and an important part of the region’s heritage, yet at the moment they are not protected by law,” as they are in neighbouring Argentina, Asun said. Current legislation allows a productive project to encroach on a glacier, if the impact is stated in the environmental impact study and some form of compensation is made. In a recent appearance before parliament, glaciologist Alexander Brenning, of the University of Waterloo in Canada, said the magnitude of interventions on glaciers in Chile was unparalleled in the world, and he urged that the cumulative effects be assessed. Parliament is studying a bill that would include a clear definition of glaciers and a permanent register of them. The ownership status of glaciers must be established, especially those situated on private land, he said. “Will they be able to be purchased and traded, as happens with water rights?” asked the expert, referring to the Water Code of the dictatorship of Augusto Pinochet (1973-1990), which made water a private resource. Mining projects like the Anglo American company’s Los Bronces, the state Chile Copper Corporation’s Andina 244 and Escalones, and Barrick Gold’s Pascua Lama, are the main threat to several glaciers in this country, according to environmentalists. For Marangunic, in contrast, while “some mining” may damage glaciers, “environmental pollution in big cities like Santiago, or smoke from burning pastures and forests,” also affect the ice masses. Therefore, in his view, the future law must be even-handed for all. “How can Santiago be penalised for producing the smog that affects the glaciers in the mountains?” he asked. Stopping the retreat of a relatively small glacier can be achieved in a year. “But getting a glacier that has been shrinking for decades or centuries back to its original size will surely take as long again,” although a large investment may accelerate the process, he said. Playing God “turns out like we saw in Jurassic Park. Since the glaciers are there, let’s protect them,” he concluded. Anybody notice that this tells that they CAN cause “climate change” ON PURPOSE?